Bachelor of Nursing (BSN) provides lots of option for advancements, which is essential for anyone interested in a nursing specialty. When comparing Registered Nurses (RNs) with BSNs, the latter seems to be the most ideal choice. BSNs generally have better skills and knowledge, though at the same time have greater duties and responsibilities. 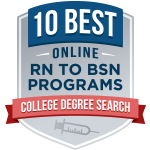 There are several programs which provide RN to BSN online courses. This is of great importance for those who have gotten a job as RNs but would like to get a BSN as well so as to increase their skills as well as their employment opportunities. However, the quality of the program offered is one of the key factors that need to be put into consideration when selecting the RN to BSN online programs.